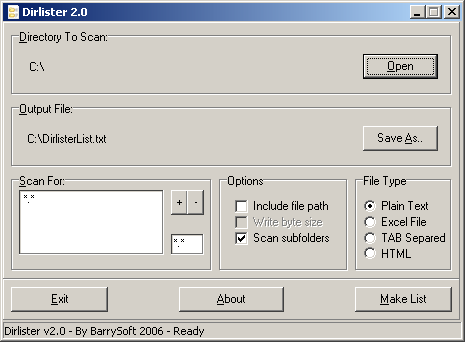 This is a little software I made a long time ago because I needed an easy way on Windows to scan for files in a directory and to output their names in a plain text file. This software is far from perfect (nor bug free) but I’m keeping it here because it may still be useful to someone. Believe me, I have looked at and loaded dozens of pieces of software to find just what you made. You can save it anywhere, output it in multiple formats at your selection and query any directory and subdirectories. I love this program. I will never be able to understand why there is no easy way of doing this in windows without resorting to esoteric methods or external software. On Unix-based systems it has always been a trivial task to do. To this day, this is the sane-est program to do this task. As others, I’ve looked at, tried, examined the many out there. Both free & ones that are not. This does what I want, when & where I want with no fuss, no muss, and no anything but satisfaction, getting the chore done for my later use of the spread out files. My biggest fear moving on to Win 7 x64 was losing access to programs I was used to and worked for me perfectly. So far it’s all good. If everyone could program as you we’d probably have a better existence. PS. Norton should take a lesson from you, it could mean the shrinking of the registry & other files by 100% or more. Thanks for your kind words, I’m really happy that you like my software and that it fits your needs. It’s always nice to know that some piece of software you wrote when you were something like 16 years old is still being used by someone! Daniele!, you’re my idol!. Making my last years (I’m an old guy…) much easier. Thanks a lot. Updated to the latest version. Not sure if it’s better than your old version. In any case I use it a hell of a lot for files burned onto dvd. & yes, I never could figured out why MS does not have some utility doing the same. Absolutely a great piece of software. Portable, and focused on the real use, and not on the special effects. allow the user to paste a copied path (when available), instead of forcing the path search always from c:\. 1) The bug Rick Hunter mentions with the last slash in a path missing (so C:\The\Path\File becomes C:\The\PathFile). 2) Not sure the program is robust to the kinds of delays and failures you get when listing large filesystems on UNC paths remotely. I would test this more, but the “missing slash” bug makes the output of limited use. I might try to find an old copy of 2.1 on the net if this doesn’t have the path bug. You are right, I’m really surprised that this program is useful at all in the first place. I made it when I was like sixteen years old with very little knowledge of programming and I’ve lost the source code somewhere in years of backups. The only option is a complete rewrite of the software and at the moment I haven’t got the time to do it. 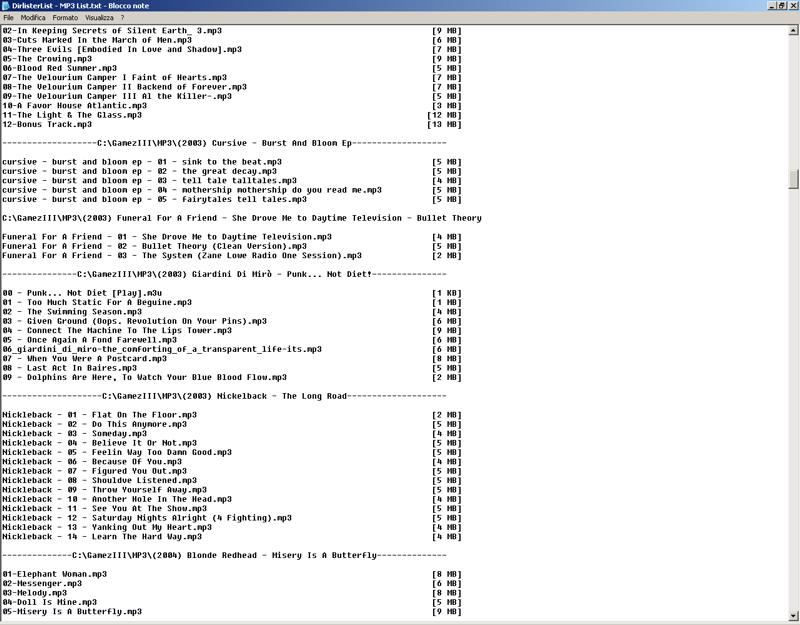 I’m very happy that this software is used by so many people though and I think I’ll attempt a rewrite sooner or later. Started using it years ago and then forgot about it when I moved to linux. Just needed it now and still remembered the name, just as useful now. Great work! This is by far the best and simplest free file/folder/directory Lister out there. I’ve tested many programs but none of them can do it with such speed and none of them have as many options and file types. Thank you very much for sharing it with others for free. One question: Is there a way to make the Output file a different default? Thanks a lot! A very handy and efficient tool! DirLister.exe helped me out of that situation. Additional comment about an error: When listing to TAB-separeted text file, the listing was missing the last backslash separator, i.e. the filename is concatenated to the directory name without a \ delimiter. Can you notify me by email if this gets fixed? I have been using the DOS based command line stuff to make a directory listing saved to file for a number of years, not pretty!. Your program is amazingly fast and so nice to view! Thank You for an excellent program. I'm Daniele Rapagnani, a 22 years old computer science enthusiast and musician (for what it's worth...). I also have a very faint perception of my person and so I hate writing short descriptions of myself.